Ocean Valley View - Morgan's Bay Accommodation. 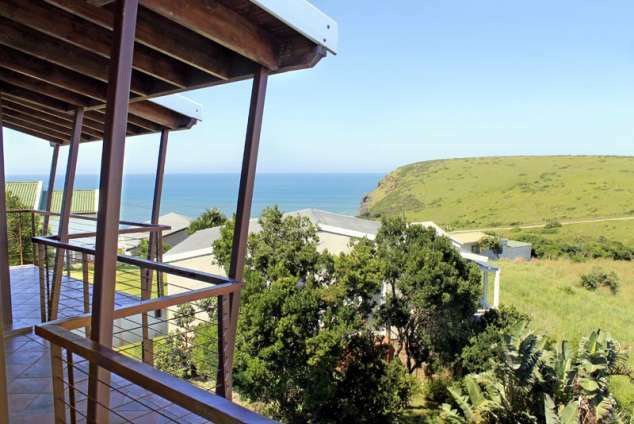 Situated in a quiet cul-de-sac in Morgan Bay, Ocean Valley view offers comfortable, relaxing self catering accommodation within very easy walking distance of the sea. The house was designed and built in 2005 with large windows in order to capture the wonderful views of the ocean, the green bush valley stretching to the Double Mouth nature reserve and the cliffs, where you can see the sea spray shower as the waves crash into the rocks. Just relax on the balconies upstairs or on the deck and enjoy the scenery! The house is furnished as a fresh, roomy family retreat, sleeping up to 10 people. 2 living room areas, one leading to a large 35 square metre wooden deck terrace. The kitchen is well equipped with a stove, microwave, dishwasher, fridge/freezer and washing machine. Flat TV screen and Hi-Fi. Satellite TV reception is available, but you should bring your own DStv Card and Decoder. There is an outside braai area with a concrete braai. There is a driveway for parking which descends from the road next to the house. The Sunshine Coast is renowned for it's many kilometres of beautiful unpolluted and un-crowded beaches and Morgan Bay is an ideal base from which to explore this. The picturesque village of Morgan Bay is an ideal location for a family/small group right on the doorstep of the Wild Coast. The clifftop walk to Double mouth is a must and the ardent walkers can continue from Double mouth along the beach to Bead beach and Haga Haga. Morgan Bay has a small bakery/grocery and hardware store. Affordable meals are available in the relaxed atmosphere of the Morgan Bay Hotel and other local informal restaurants. Fishing, hiking trails, various beach activities, horse riding trails, cycling and mountain biking, windsurfing, surfing, swimming, bird watching (approximately 250 different species), viewing whales and dolphins and seaside rock climbing. 28183 page views since 12 Sep, 2008.